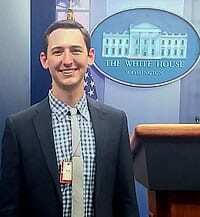 Bo Mahr ’17L spent the summer working for the White House Council on Environmental Quality (CEQ) in the Office of the General Counsel as a Law Clerk. At W&L Law, Bo serves as vice-chair of the Moot Court Executive Board. He is a graduate of the University of Missouri-Columbia. Bo received partial funding for his internship from the A. Paul Knight Program in Conservation. I worked for the White House Council on Environmental Quality (CEQ) in the Office of the General Counsel as a Law Clerk. The CEQ is a part of the Executive Office of the President and helps coordinate and develop national environmental policies and initiatives. The Office of the General Counsel was a small team that included four clerks, four attorneys, and the General Counsel. As a 1L interested in environmental law I was told to talk to Cameron Tommey (’15L). Little did I know at the time, he had previously worked as a Law Clerk at the CEQ. He helped me pull my application together and served as a great resource during the interview process. Both the breadth and depth of the work done at the CEQ were impressive, and being a part of a small team meant that I was able to contribute from the start. From memos over public lands to briefings about renewable energy credits, I covered more ground in three months than I thought was possible. Overall, it was working with incredibly qualified individuals who cared deeply about the work that set this experience apart. What were some of the skills you developed this summer? I refined my ability to communicate with those from other professional backgrounds. A good deal of my time was spent talking with experts in other fields than law. This meant that I had to come up to speed on the technical, economic and scientific side of the issue while being able to frame the legal and regulatory implications in an easily digestible manner. At a place where few people are generalists, this became a key ability to have. Professor Jill Fraley, my Law and Geography professor, was key in my preparation for my summer clerkship. Regardless of the issue, legal or otherwise, the ability to write in a concise and understandable fashion was invaluable. While Law and Geography, a writing intensive seminar, covered environmental issues relevant to my work, it was the lessons over sentence structure and organization that proved most valuable. What really stood out to me was the opportunity to interact with stakeholders from across the country. As a part of the E.O. 12866 process, stakeholders from various States, nonprofits and companies came in and told their stories and were open for questions. Often I can be too consumed with the legal issues in front of me and I forget to step back and understand why I am doing this and for who I am doing it. The gravity of the issues we were trying to solve was something I won’t soon forget. To be able to be a small part of an Administration that is tackling conservation and climate change with a renewed sense of importance was truly a great experience. For all the progress that has been made, this summer reminded me just how far we have to go in solving many environmental issues. This experience served to reiterate the importance of working for an organization that is out there making a difference. I have a new focus on what it is I want to do and where I want to do it. This means that when I take classes such as Professor Carr’s Federal Energy Regulatory Practicum I’ll be able to retain even more about administrative law than I would have otherwise. It also helps me put into perspective the impact that knowing administrative law can have on solving complex and important issues.